In this series of The Future of Fashion, I assemble the ideas behind creative mind in fashion, of what the future of garment construction will look like. It seems that we have seen everything: dress with every possible length and structure, colours with more than mere fifty shades, materials from recycled garbage to perfectly-cut diamonds. Many critics say that we have seen repetition more often than it should be. Designers keep recyling the ideas from the past and cultivating old ideas for their designs, and yet very few propose the-next-big-thing that could be the new look of 21st century. So the question is, what would people in the upcoming decades possibly wear, which has novelty in many aspects? Jennifer Lopez wore a stunning, tech-savvy dress during a taping of performance on "American Idol" on March 19th. 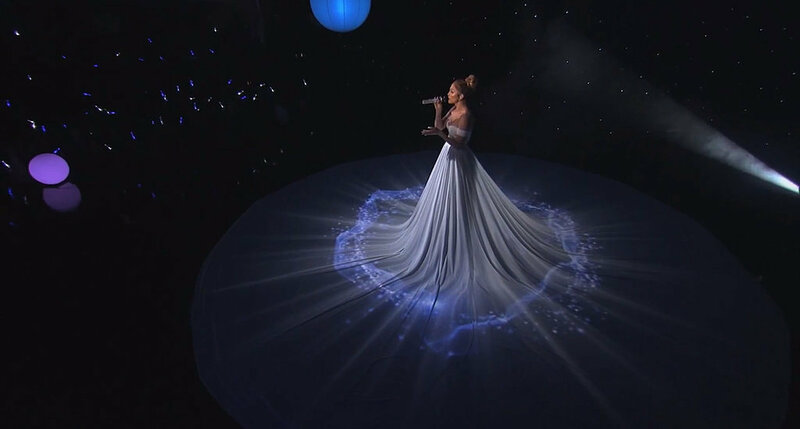 The star wore the dazzling floor-length dress and skirt combo while singing her new single "Fell The Light", an original soundtrack for the animated film Home. 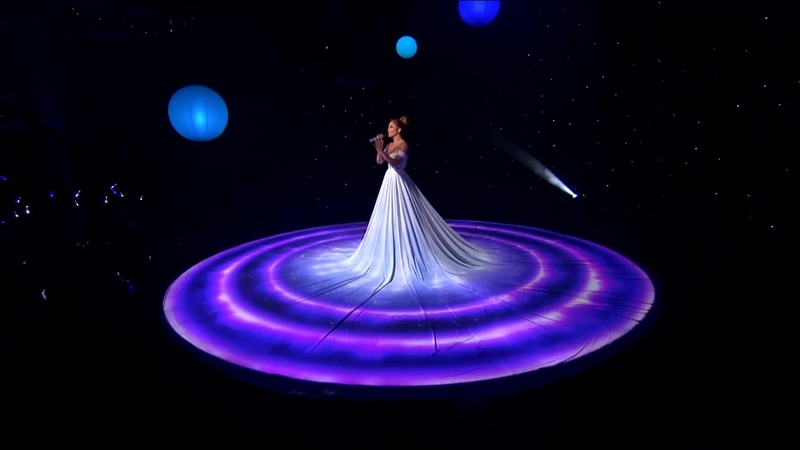 But it wasn't her vocal range that had everyone talking — it was her white gown with what felt like a never-ending circular train that practically took over the entire stage. Ms. Lopez explained, "It was a projection. It just came together so beautifully…I couldn’t have asked for more. It’s a vision I had for a long time but the way it came together was even more than I imagined." "The gown is actually a dress with a 20-foot radius skirt attached to it," stylist Rob Zangardi (ranked No. 17 with Mariel Haenn on THR's 2015 Most Powerful Stylists in Hollywood list) revealed to Pret-a-Reporter. The duo designed the performance look in only two days. He added, "The look was inspired from an old vintage reference that we've been holding on to for a long time, waiting for the right moment." Sourcing the fabric from International Silks & Woolens in L.A., Haenn further said that "the dress was two separate pieces. There was the dress by Misha that gave us the top silhouette and the giant skirt was then placed over that." "It wasn't until she stepped in and we took her picture in it and showed her how she looked in it that we got the 'wow' reaction!" shared Haenn of the singer's response when seeing the final design. 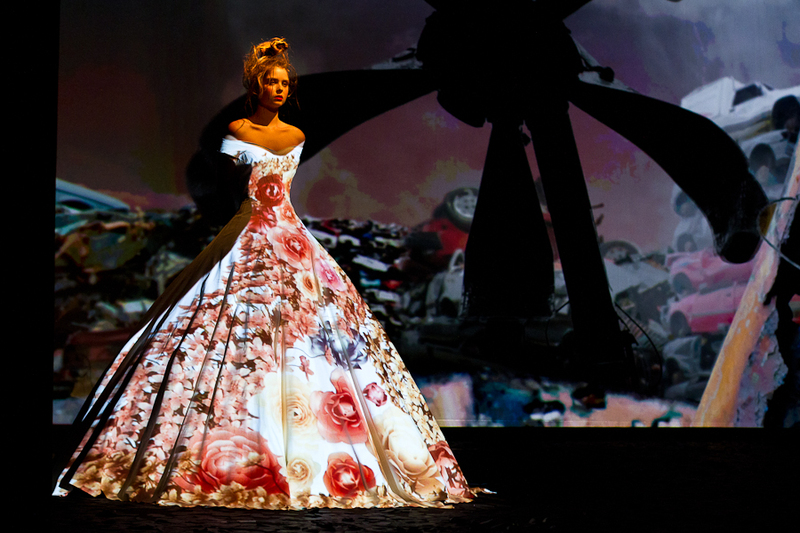 "We were hoping to be able to make a dress that was stunning on its own but also simple enough to allow the animation and projection to be as functional as possible." Meanwhile the projection was mapped out and created days in advance to ensure proper placement on the skirt. 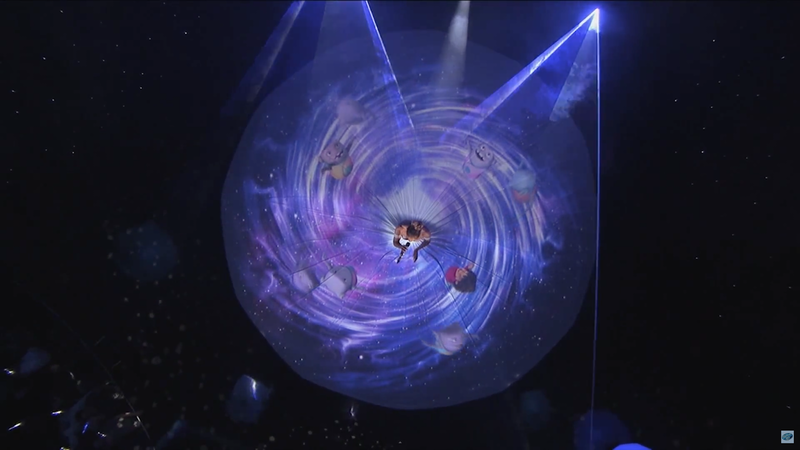 Since the "Feel the Light" single has such an encouraging message (lyrics include "We're bringing it all back/Feel the light/Shining like the stars tonight"), Zangardi said they "needed a giant canvas to convey such an uplifting sentiment aesthetically. Cue the sizable skirt!" He added,"We wanted this to be spectacular yet elegant." Spectacular it was indeed. But where is the inspiration actually coming from? 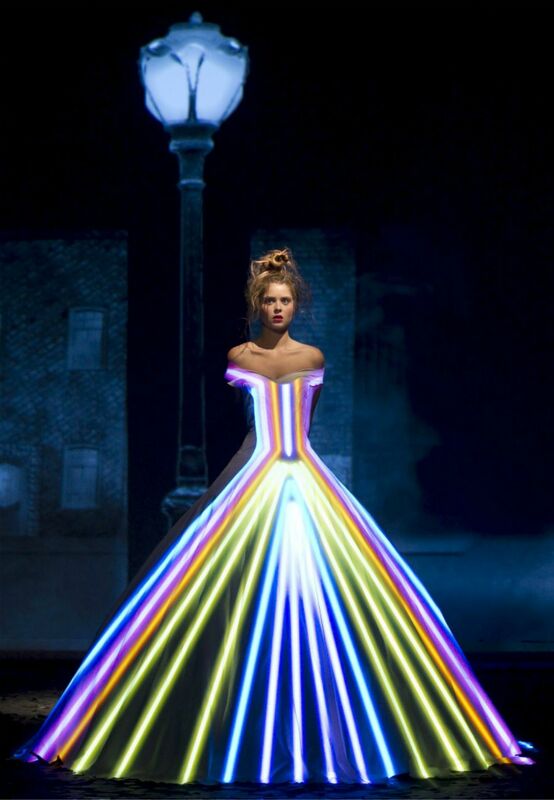 A dress as a canvas, projecting a variety of a special light effects, is something novel, yet rare. 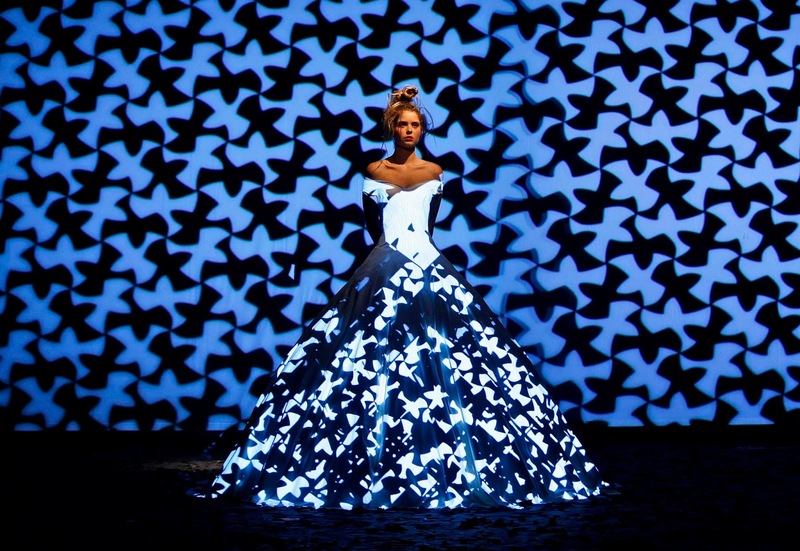 It takes a lot of preparation beside the dress itself in advance, and the fact that light will be shot onto the dress doesn't allow the wearer to move too much, as it would make complication of the pattern projected. 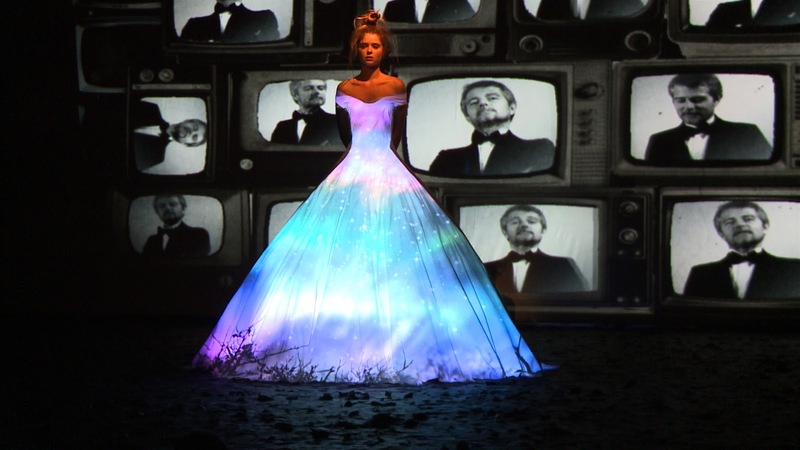 While some people called the idea as an impersonation of a dress worn by Ukrainian singer Eva Bushmina, or Carrie Underwood's dress during her Grammy performance in 2013 created by Irish desiner Don O'Neill, it is actually Franck Sorbier, a grand couturier of Paris haute couture, who has the initial idea of this canvas light dress. It was his colection of fall/winter 2012/13, presented in July 2012, a show inspired by "‘Donkey Skin’ in a 21st century way", featuring one single dress with this visionary concept on a crinoline dress in white silky skins, with successive projections of crystal pendants, dew-drops, mosaics or endless roads. 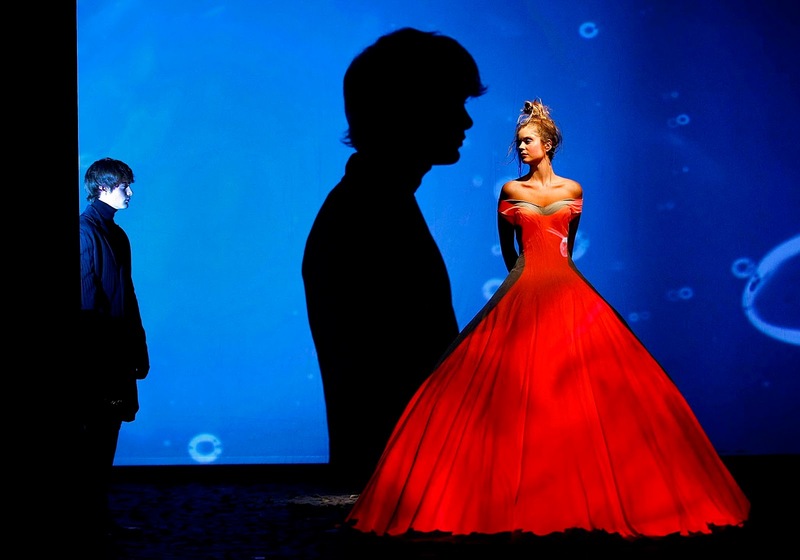 So many virtual dresses, which in the absence of being wearable, they create a magic along with eleven other looks. 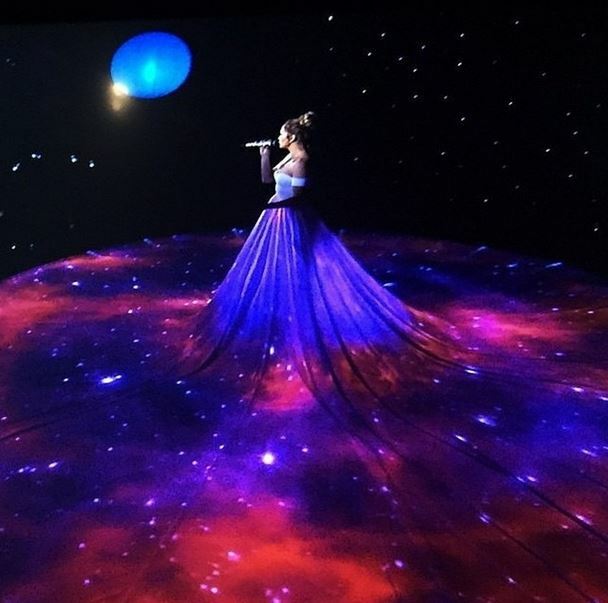 The couturier even accused the design of Carrie Underwood's dress for an act of plagiarism, juxtaposing both the picture of the actual dress and Carrie's, then posting it on his official Facebook page, whose photo album looks more like a well curated digital art gallery. Called as a genuine couturier (the one who doesn't care if his designs will sell or not that is, which then applies that his designs are solely based on creativity and savoir-faire without getting contaminated by commercialism), Franck Sorbier creates in incredible way, more often quirky than not. It is always elaborate, meticulous, and many times, original. And when theory says that haute couture is the laborartory of fashion, now we finally see the final stage of his idea developed to perfection. The precise placement, the timing, the lighting. New ideas are born in haute couture, and it's every body's job to aggrandize it! How it could be elevated: The light come from inside the dress, so you can wear it without having to be indoor and you can just extemporise. And perhaps, changing shapes?